The February 2017 election of Mohamed Abdullahi Farmajo as Somalia’s President and the subsequent appointment of Hassan Ali Khayre to the Prime Ministerial docket heralded a new era of peace and stability in the country. Prior to this historic development, Somalia’s Executive branch of the Government was rocked by persistent infighting dating back to the administration of President Abdiqasim Salad who took the reins of power in the year 2000. For sixteen tumultuous years, the ceaseless wrangling at Villa Somalia set back the clock on national reconciliation and development, shattering the tenuous peace while derailing the reform and security agenda critical to rebuilding the war-torn nation. The perennial squabbling at the executive level resulted in political paralysis that hampered the peace-building and state-building processes with no end in sight as extremist elements took full advantage of the unfolding crisis of governance. As noted by two leading Somali analysts, Professor Afyare Elmi and Ambassador Abukar Arman in a December 2013, opinion piece, every pair of leaders elected or appointed since 2000 were mired in a spiral of infighting in which crucial time was lost and institutions were damaged. Between 2000 and 2016, Somalia had four Presidents and 10 Prime Ministers, casting a grim picture over the country’s prospects for peace. During the 2000-2004 reign of President Abdiqasim Salad, three Prime Ministers were sent packing including Ali Khalif Galaydh, Hassan Abshir Farah and Mohamed Abdi Yussuf. The disturbing trend continued with the Transitional Federal Government (TFG) of President Abdillahi Yusuf that saw the forced resignation of Prime Minister Ali Mohammed Ghedi, before the second Prime Minster in this turbulent period, Nur Hassan Hussein (Nur Cadde), orchestrated the downfall of Abdillahi Yusuf. The TFG administration of Sharif Sheikh Ahmed (2009-2012) was not spared of this scourge as Prime Ministers Omar Abdirashid Ali Sharmarke and later Mohamed Abdillahi Farmajo were forced from office with Abdiweli Ali Gaas serving as the third Prime Minister before Shariff Ahmed was dethroned in 2012 by Hassan Sheikh. During the tenure of President Hassan Sheikh Mohamud (2012-2016), two more Prime Ministers, Abdi Farah Shirdon and later Abdiweli Sheikh Ahmed, were shown the door following another round of infighting that saw Omar Abdirashid Sharmarke making a comeback as a third PM. Somalia’s unrelenting executive infighting finally came to an abrupt halt, with the 2017 election of President Farmajo. 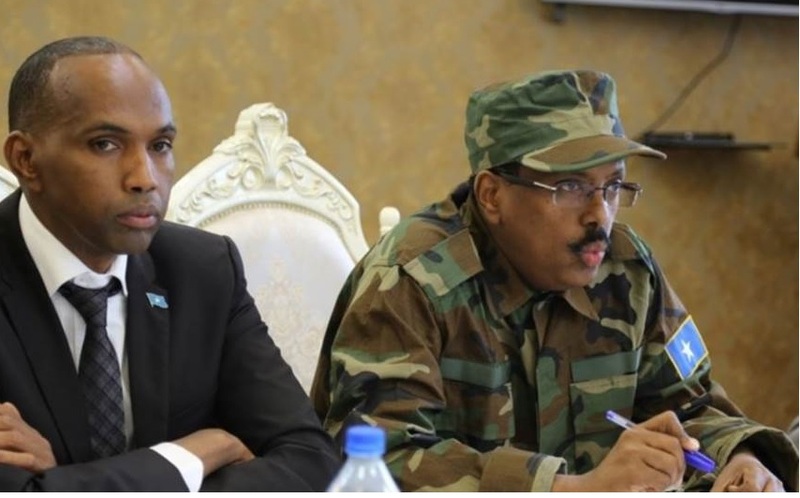 In the last two years, President Farmajo and Prime Minister Khayre have charted a new era in Somali politics, creating a stable environment in which a principled executive leadership has led by example. By restoring peace across the country with Al-Shabab largely degraded and by moving fast to slay the dragon of corruption, the current government is setting new standards in fiscal management, democratic governance and in the delivery of public services. As faith in the government’s ability to steer the country forward increased, international donor partners responded by extending much-needed aid. In September 2018, The World Bank approved $80 million in grants to Somalia to fund public finance reforms, marking the first such disbursement to the government of the conflict-ridden country in 30 years. Somalia’s economy is forecast to grow by an average of between 3.5 and 4.5 percent annually in 2019-2022, when the partnership on social services will run, the bank said. A day after the World Bank’s announcement, the European Union (EU) approved a €100 million ($116m) budget to support Somalia’s government – the first time the EU has dedicated funds to the Horn of Africa nation. During the Forum on China-Africa Cooperation, held in Beijing, September 3-4, 2018, President Farmajo held bilateral talks with his Chinese counterpart, Xi Jinping and further strengthened the country’s international standing by signing Somalia onto the landmark Belt and Road Initiative and Economic and Technical Cooperation Agreement. According to regional analysts, the EU and World Bank disbursements in addition to China’s Cooperation Agreement are the latest show of confidence in the Somali government’s reforms and recovery plans. Buoyed by the stellar reforms implemented by their government, members of the Somali diaspora have been returning in droves taking part in the reconstruction process by investing in key sectors of the economy while imparting technical skills in the public sector and in the development and humanitarian fields. In January 2019, the UN acknowledged that despite challenges, Somalia has maintained a positive trajectory — marked by a ―far‑reaching‖ reform agenda and expanded domestic revenue due to the Government’s commitment to implementing reforms through roadmaps in various sectors — inclusive politics, security and justice, economic recovery, and social and human development. More importantly, Somalia’s spectacular economic turn- around is clearly demonstrated by its ability to generate revenue domestically. Finance Minister Abdirahman Duale Beyle said domestic revenue increased to 143 million dollars in 2017 from 113 million dollars in the previous year with 42 million dollars realized in the first quarter of 2018. According to the UN, better public financial management and an expanded domestic revenue base mean that 56 per cent of the Federal Government’s $340 million budget for 2019 will be financed from domestic sources. The overall goals of the current Somali government are to move away from reliance on donor financing to self-sufficiency in the economic sphere. By prioritizing security, economic development, good governance and efficient delivery of public services, the current government is steering the country into a steady path of recovery, economic prosperity and durable peace as Somalia proudly takes its rightful place in the community of nations.